Every car needs regular maintenance to keep it on the road and running smoothly. In your vehicle handbook or maintenance guide, the manufacturer will have set out exactly what your vehicle needs at different stages in its life. For example, at 20,000 miles you may need to have spark plugs replaced, or at 40,000 miles your fuel filter may need to be checked. At Euro Repar Car Service, we are happy to carry out any servicing requirements specific to your vehicle. We’ll always replace the engine oil and any necessary filters, and let you know about any other necessary work. Even if your vehicle is still under warranty, we’ll make sure it’s protected by following the manufacturer’s guidelines - just let us know when you book it in. 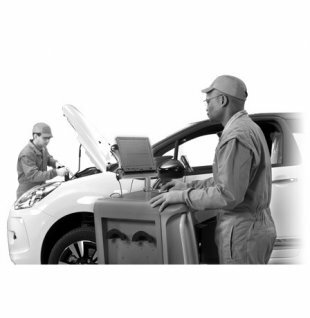 Whatever vehicle you drive, every Euro Repar Car Service Centre is equipped with the latest multibrand diagnostic tools. This helps us to understand exactly what’s needed and identify any faults. Use our simple Online Booking form to book your Service at your local Euro Repar Car Service centre. Your driving style and the miles you cover can change how often you need to have your car serviced. Frequent driving in the city, with stop/start traffic, can be just as strenuous for your car as long journeys. If you’re not sure, bring your car in for an interim service every 6 months. Engine oil level, tyre wear, wiper blades and lighting will all be checked as part of your service. However, you should still make sure to check these yourself on a regular basis. Euro Repar Car Service centres are always happy to carry out a specific manufacturer service on your car to protect its warranty. Just let us know when you book an appointment with us.